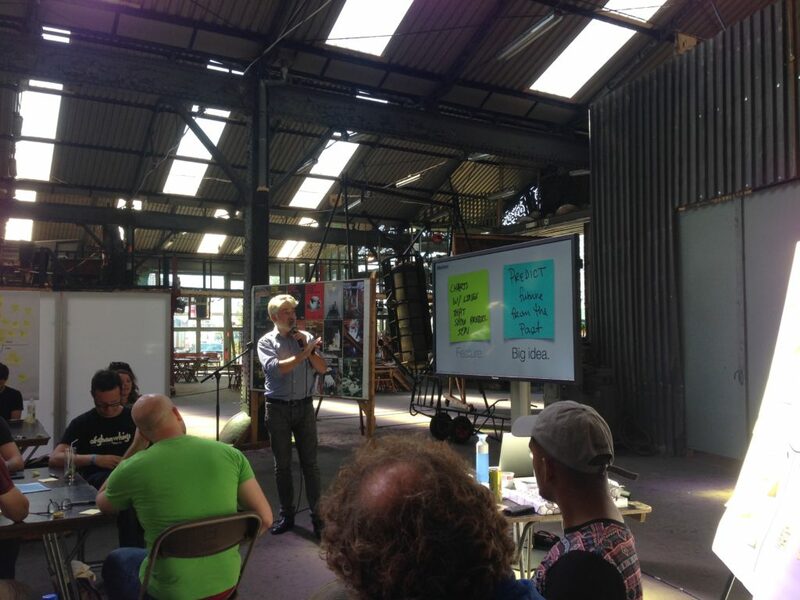 I had the opportunity of joining an IBM Design Thinking Workshop at the wonderful DAREfest in Antwerp this week. IBM has been investing a lot in their version of Design Thinking the last 5 years, and in January they even published their guidelines as their big company proof version of Design Thinking. It’s one thing to read their guidelines, but it’s even better to have a workshop by people from IBM themselves, in this case, Isabelle, Petra and Stephane. 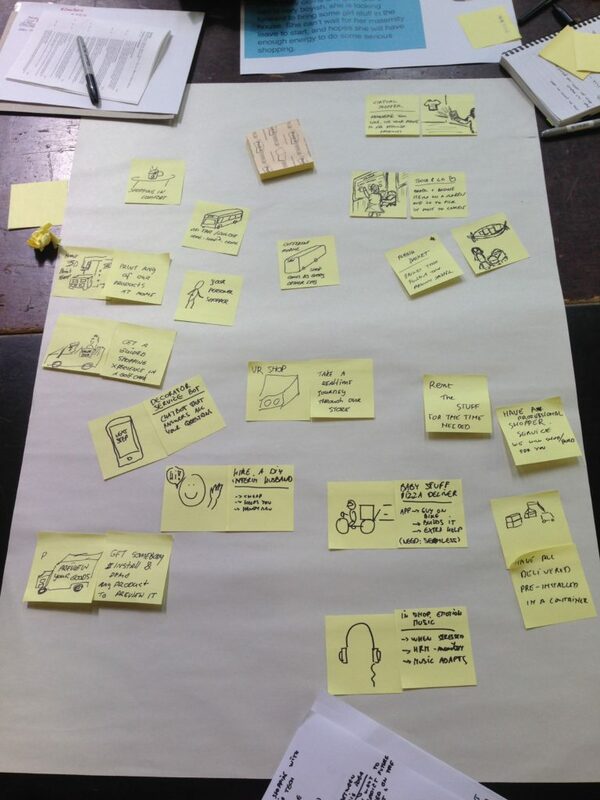 IBM Design Thinking Workshop part 1: What is IBM Design Thinking? As these outcomes are human centred, it’s a lot about empathy. The reason why IBM switched to Design Thinking is the fact that they found Agile methodologies lacking too much connection with end users and thus empathy. 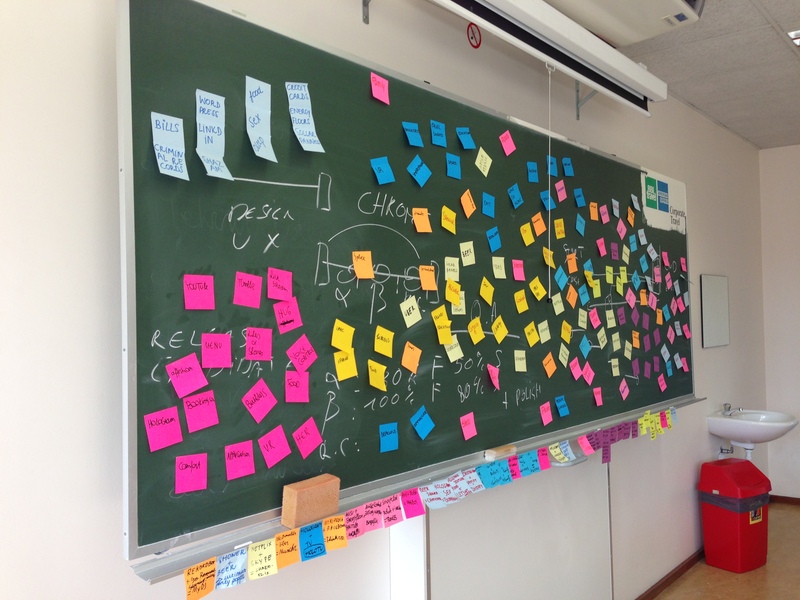 [addition 29/8: To clarify, they did not switch from Agile to Design Thinking. They added it to their agile practices, complementing the iterative nature of agile with the empathic user focus of design thinking. See this comment from Adam Cutler]. 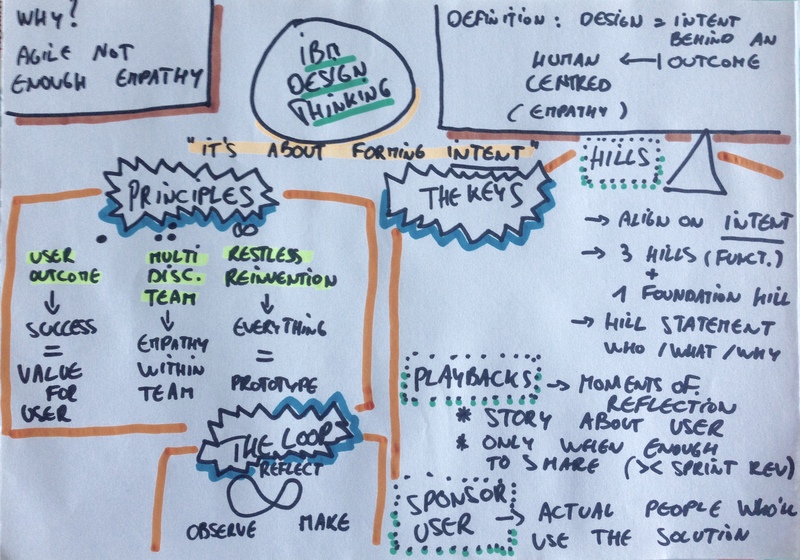 IBM Design Thinking is about forming shared intent, based on empathy with end users. Within the framework there are 3 basic elements: Principles, The Loop and The Keys. Focus on User Outcomes. Success is added value for the user. The use of interdisciplinary teams. Creating empathy, also within the teams. Loops and the idea of restless reinvention. Am I still doing the right thing? Everything can be a prototype. The Loop is a metaphor to illustrate the 3 stages, observe, reflect and make, which are being iterated. Finally the Keys are some core practices. Playbacks: moments of reflection, where a story is being told about a user. You could compare them to sprint reviews I guess, but they are not timeboxed. They only occur when there is enough to share to the team. Sponsor Users: the goal is to encompass actual real people who’ll be the end users of the solution. Not just testers which can be biased. In small teams, we had to come up with a solution for a brick & mortar shopping business, using Internet of Things and Cognitive technology. We were given an existing persona – for the speed of the workshop’s sake – in our case Sandrine, a 37-year old mum who was expecting a second child and needed new furniture. 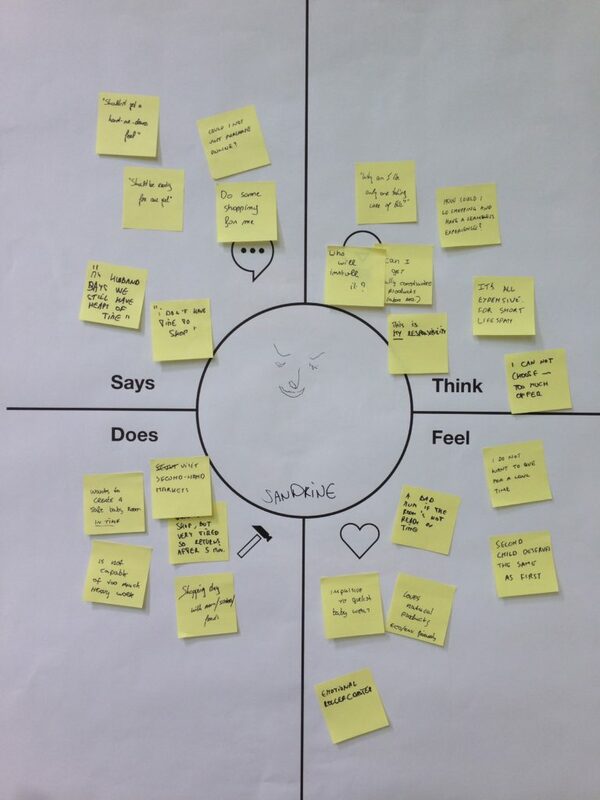 First tool we used was – good old – empathy map. Next up was Big Idea Vignettes. The thing is to make a distinction between features and ideas. You use two sticky notes, one for a drawing, and the other one for a title and a caption. We were asked to each come up with 3 big ideas, and 1 far fetched crazy idea. Final step was condensed storyboarding. Really simple, just 6 stickies you could use, picking one of the ideas from the group individually, of course focussing on the “to be”-experience. Next step (if we would have had more time) would be merging the storyboards into a group version. I really like the clarity from IBM’s Design Thinking framework. Nice condensed workshop, as it’s not easy to communicate a complex thing such as Design Thinking in such short time. I really loved the concept of “Sponsor User”. Making it an explicit key, puts value on empathy with the end user, which is basically the essence of Design Thinking. Thanks for such a nice write up. I wanted to clarify a statement you made. This isn’t the case. We didn’t switch from Agile. 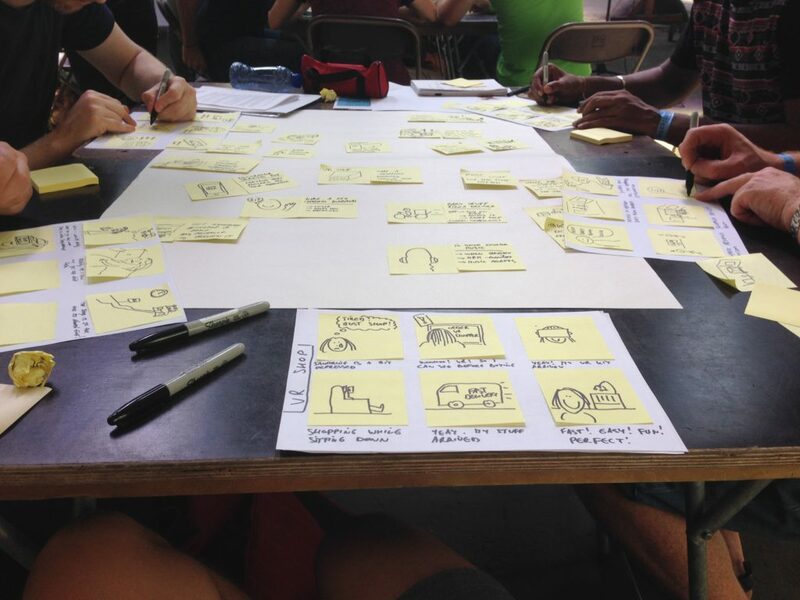 IBM Design Thinking compliments Agile, it doesn’t replace it. There are shared principles between them…Clarity of outcome, Iteration and learning, Self-directed whole teams. IBM Design Thinking places the emphasis on our users whereas Agile places the emphasis on rapid and iterative delivery. Thank you for pointing out this important nuance. I made a small addition. Glad you helped me iterate this blogpost :).